This accessory will play nice with the recently introduced Apple TV, where it enables users to interact with App Store games on their TV via the new Siri Remote. Survivor Play has been specially designed with gaming in mind, as it delivers an ergonomic and protective solution regardless of how many hours you decide to throw into your “shift”, as it slips on the Siri Remote effortlessly, and is able to be used all the time for an easier, more comfortable way to hold the remote. 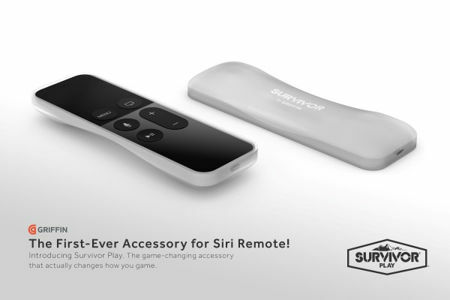 Survivor Play for Siri Remote will ensure that users get a grip on gaming thanks to its no-slip, impact absorbing silicone which surrounds the remote’s back and edges. Apart from that, additional cushioning can be found on the edges and corners of the Siri Remote, where those happen to be the places which are most likely to be damaged if the remote is dropped. Should the Siri Remote make its way like a Wiimote gone astray during a frantic gaming session, fret not – the Survivor Play has been designed to keep it safe when it lands, although the same cannot be said for your precious family heirlooms in the living room like that Ming dynasty vase. The textured silicone and extra thick grips on the back of Survivor Play deliver an easy and comfortable way to hold onto it regardless of the manner, and it does not get in the way of anything, so that you can easily access Siri Remote’s buttons, touchscreen, mic and Lightning charge port. The asking price for the Survivor Play for Siri Remote as it arrives later this fall would be $19.99.each.